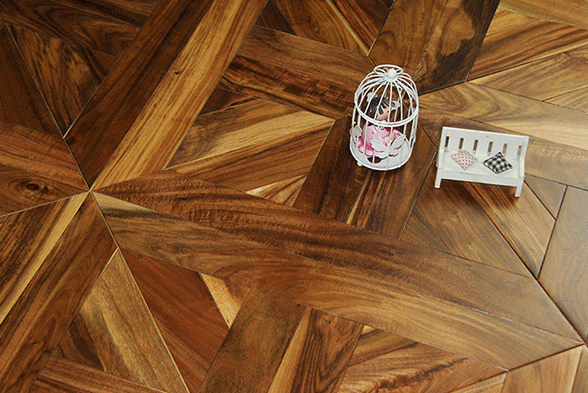 Acacia parquet wood flooring comes in multi-layered structure with some specific geometric patterns carved from 2-4mm thickness acacia real wood veneer bonded onto the plywood block of size 450x450mm, 500x500mm,600x300mm etc,the cross dimensional CARB certified plybase contribute to the great stability after parquet installation.There are many pattern designs available for such modular acacia parquet thanks to our advanced CNC machines carving in accurate way to present an unique magnificiant flooring. Each part of the patterned parquet with acacia comes in natural variations while the overall look display all features of the hardwood, it makes uniform beauty out of natural hardwood color variations. In the meantime, we can stain it with either lighter or darker color to suit your taste.Each unqiue geometric patterns transforming European Antique cultures into your room charming. The parquet flooring manufacturing is a slow & hard job, which makes it much more costly than common engineered wood plank floors.But it really helps to build up luxry room, especially for the big halls of high end residential projects.